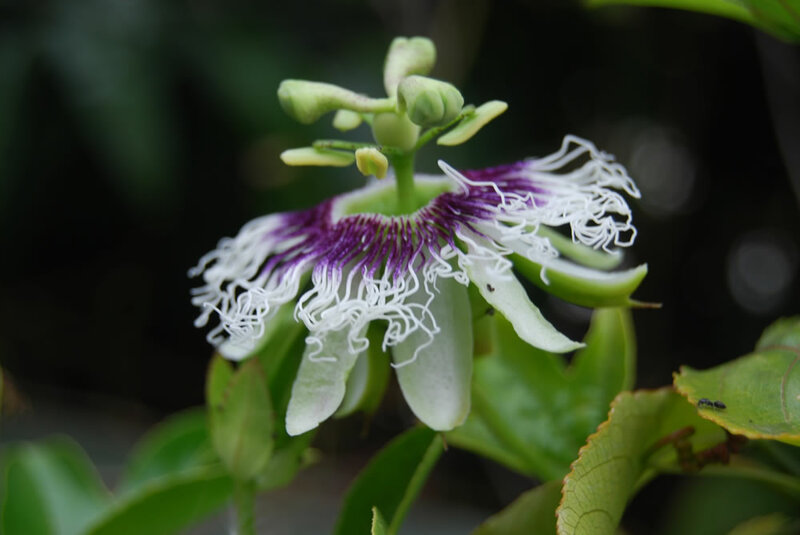 Distribution and habitat: Passiflora caerulea is a species of flowering plant native to the rain forests of South America (Argentina, Paraguay, Uruguay and Brazil). It is a woody vine capable of growing to 15–20m (49-66 feet) high where supporting trees are available. It is found on margins of forests and gaps and in riparian zones (banks of watercourses). 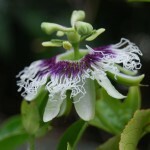 Description: Passiflora caerulea is a vigorous, deciduous or semi-evergreen tendril vine growing to 10m (33 feet) or more, with palmate leaves and fragrant, blue-white flowers with a prominent fringe of coronal filaments in bands of blue, white, and brown. The long, thin stems attach themselves to any available support by means of spiral-shaped tendrils. 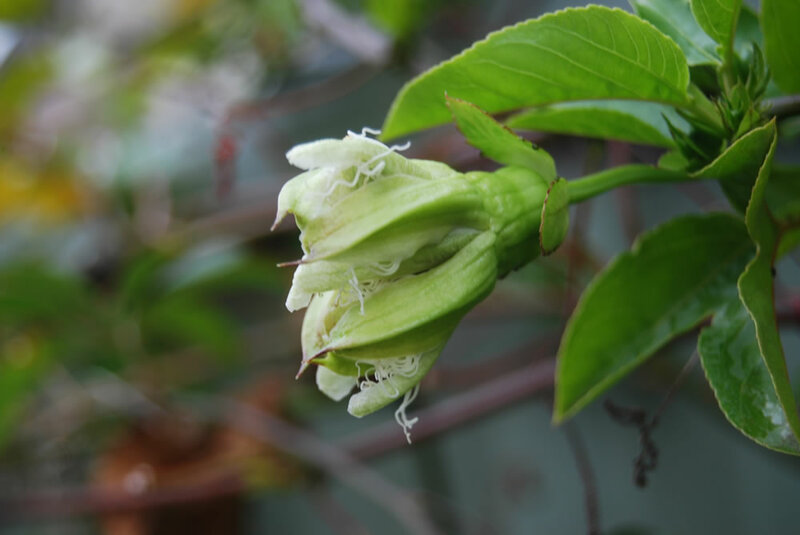 It has a wiry, dark green, angular stems bearing shiny and deep green leaves. The leaves are alternate, palmate-shaped – five-lobed like a spread hand (sometimes three or seven lobes), 10cm (4 inch) long and wide. The base of each leaf has a flagellate-twining tendril 5–10cm (2-4 inch) long, which twines around supporting vegetation to hold the plant up. 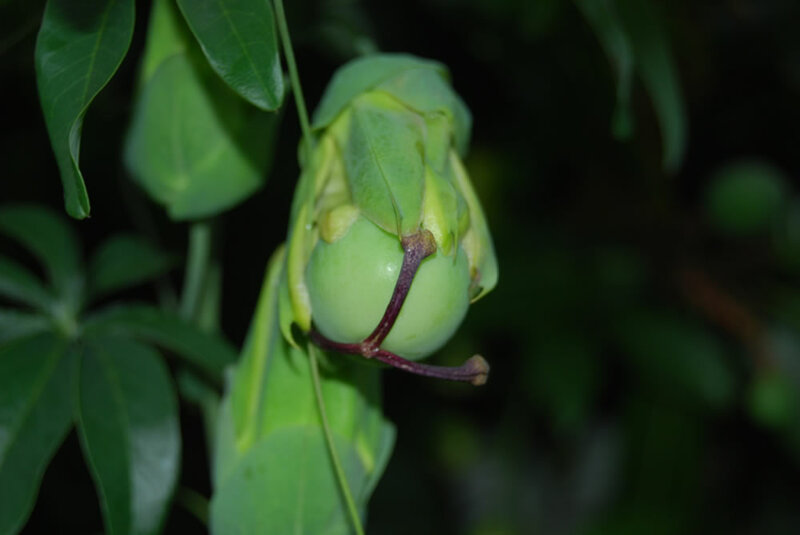 Short-stalked, saucer-shaped flowers open up from fat, pale green, oval buds that appear singly along the stems throughout the summer and early autumn. Each 8cm (3 inch) wide flower consists of five white petals and five white sepals of equal lengths encircling a wheel-shaped collection of fine, colourful filaments with five prominent golden antheras and three brown stigmas in the centre. The filaments are purple at the base, white in the middle and blue at the tip. In the wild and in the garden the flowers are followed by 5cm (2 inch) long, yellow to orange, fleshy, edible fruit, but this are not produced indoors. The plant has a very long flowering period, from early summer to early autumn, though individual flowers only live for about 48 hours. 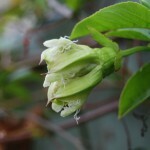 The flowers are open all night and start to close in the morning and they are delicately scented. 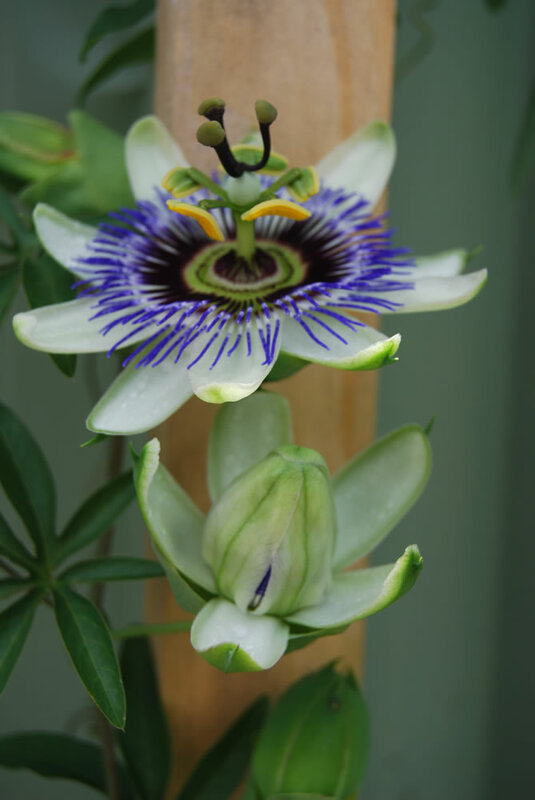 Houseplant care: Passiflora caerulea is grown as an indoor plant, it is relatively easy to care after and will flower when still young, even in a small pot. It require supports to cling to and they usually benefit from drastic pruning. In early spring cut young plants (but not recently rooted cuttings) down to within 15cm (6 inch) of the potting-mixture surface. Prune older plants as much as necessary and cut back every side branch to 5-8cm (2-3 inch). Drastic pruning of older plants will not affect them adversely. Provide all plants with thin supports to which tendrils can cling. 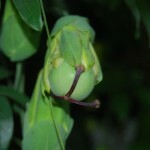 Guide young growth by twining it gently around the supports until the stems produce tendrils. 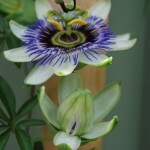 Passiflora caerulea are particularly attractive when they are trained over two hoops of stout wire. Place the two hoops opposite each other in the potting mixture. 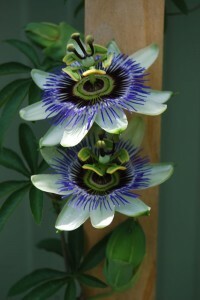 Light: Grow Passiflora caerulea in bright light throughout the year. It should be exposed at least three to four hours a day to direct sunlight. 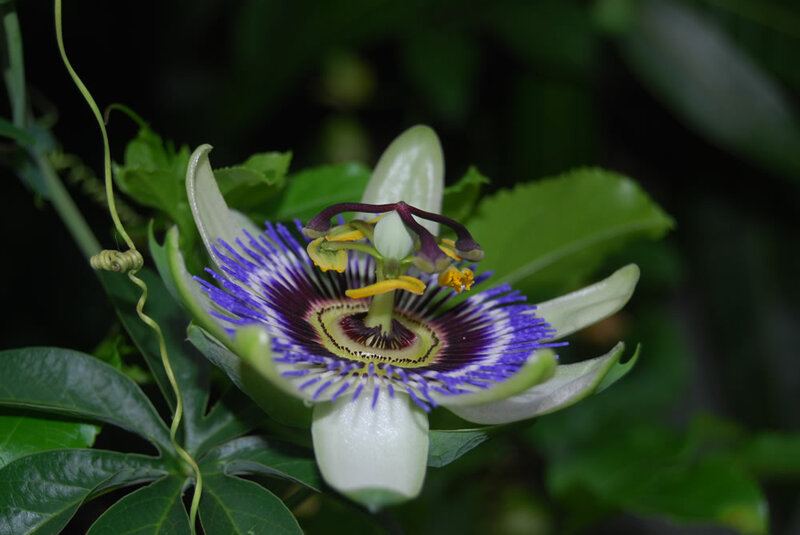 Temperature: During the active growth period Passiflora caerulea will thrive in a warm room, but it needs a winter rest period in a cool position, ideally at a temperature of about 10°C (50°F). It requires moist air. Stand the pot on a tray of wet pebbles and spray-mist the leaves daily with room-temperature water. To ensure blooming, give your plant slightly cooler nighttime temperatures. A difference between day and night temperatures of 8°C (15°F) will do. It also requires 4 hours or more of direct sunlight. Water: During the active growth period water plentifully as often as necessary to keep the potting mixture thoroughly moist, but never allow the pot to stand in water. During the rest period give only enough to keep the potting mixture from drying out. Feeding: Apply standard liquid fertiliser about every two weeks during the active growth period only. Potting and repotting: Use a soil based potting mixture. Although a young plant will flower in a 10cm (4 inch) pot, it must be moved into a 15cm (6 inch) size pot in the following spring. There after, move the plant into a one size larger pots in spring whenever necessary. Because larger pots tend to encourage stem and leaf growth at the expense of flowers, use pots no larger then 20cm (8 inch) and top dress with fresh mixture annually. Propagation: Propagate in summer by 8-10cm (3-4 inch) long stem cuttings. Take each cutting just below the leaf, remove the lower leaf, dip the cut end in a hormone rooting powder and plant the cutting in an 8cm (3 inch) pot filled with moistened equal parts mixture of peat moss and coarse sand. Enclose the whole in a plastic bag or propagator case and stand it in bright filtered light. Rooting should normally occur in three or four weeks. When new growth begins to appear, uncover the plant, move it into bright light and begin to apply standard liquid fertiliser about every two weeks. Water only sparingly, however and stop feeding the new plant at the beginning of winter. Leave it in its pot and give it the winter rest recommended for mature plants. In early spring move the young plant into a 10cm (4 inch) pot of standard mixture and treat it as a mature Passiflora caerulea. 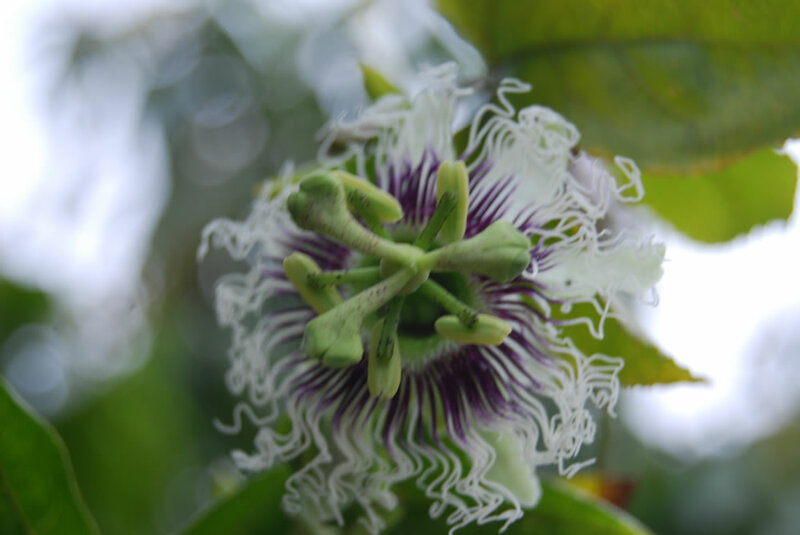 It is a good idea to inspect the passion flowers plant for mealy bugs. Treatment: If you see a white cottony substance, wipe them away with a cotton swab or cotton ball dipped into rubbing alcohol. 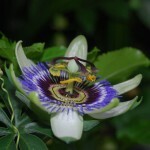 Availability: Passiflora caerulea is available for sale nearly year-round at some online garden sites that offer tropical plants. 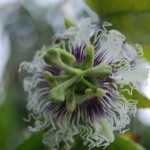 Uses: Passiflora caerulea is widely cultivated as a wall-climber or as ground-cover. In milder temperate areas it can be grown outside and can become invasive, the twining shoots constantly appearing unless eradicated.